This is me backstage at a Leeland concert. This is the band Willet and their awesome van. This is me and my girls on the last night. I just wanted to take a few moments really quickly to update you on my weekend. I am tired to begin with. We have been working 12-15 hour days in the warm and windy corn fields of South Dakota where this festival is located. Lifelight Festival is the largest festival in North America I believe and the cool part about it is that it is free. The incredible people who run it have made it their mission and ministry to put this festival on free of charge. Because of this, it attracts over 300,000 people through out the whole weekend. I have met the most amazing people here and though I don't have time to share all the details I want to share a few. I have been floored by the passion that is exhibited here for these children. I see these little faces every day and am burdened for them but to see others be equally passionate and emotional when it comes to getting these children sponsored has been amazing. I have met two girls in particular who I have come to love, Crystal and Laura. They have both been a blessing to me this weekend and I cannot tell you how much I will miss them. Their hearts are so incredible and they have challenged me greatly. I have also met many bands this weekend that have an incredible heart for the orphan and widows of the world. A band called Willet has been volunteering with us all weekend as well as playing at the festival, these three guys are great and a ton of fun. The best part is that their hearts are incredibly passionate about sponsorship. I also experienced one of the most memorable things last night. 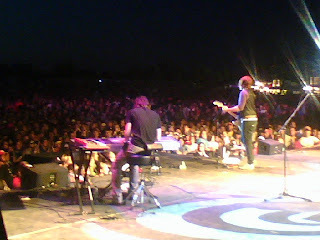 I was able to be on the side of the stage as Leeland played and gave an appeal for sponsorship. To look out over the crowd and see over 120,000 people worshipping the Lord was amazing. It brought me to tears at one point as I looked into the front row and saw teenagers pouring their hearts out to Jesus. I cannot even begin to tell you what a blast it was, words cannot describe it. Joel was right in his story about Switchfoot and Michael W. Smith. I saw them up close and personal along with a number of other artists like Lincoln Brewster, Building 4:29, Natalie Grant and many more. I have to tell you that I am not really into Christian Music, but seeing and meeting these people and hearing their hearts for God was great and gave me a greater appreciation for what they do and the impact they have. We also had the cool opportunity of having all access back stage passes which meant that we ate all of our meals with the artists and we were able to use the nicer toilets! Well, I have to go to bed now. I will be up in just about 4 hours to catch a flight home. This week will be very busy because this last weekend we met our goal of sponsoring 300 kids at this festival. PRAISE THE LORD! Well off to bed for me. Wow my sister spoke in front of 120,000 people...I am... well proud. Way to go sister, you are shining light for Christ and its fun to watch your heart for those kids. Keep up the good work. Way to be bold!! Sounds like a great trip, Katie... Thanks for sharing it with us!!! Well, I didn't really speak in front of 120,000 people, I was just back stage as other people spoke in front of that many people. But thanks for your encouragement and support.